The week is designed around the Boy Scouts of America – Merit Badge program, however, any student regardless of school, group or gender can participate. Ages 12-18. Participants will have the opportunity to build a hand stitched, hand laid wood kayak, canoe or hybrid. Schedule spans 6 weeks (one day each week). This program is centered on woodworking, art and science. Each student must arrive prepared and ready to explore. They must be respectful to everyone, remain safe and be good stewards towards the program. Students and parents need to be flexible. There will be homework. There may be a need to meet outside of the session schedule (by mutual agreement). Students must take care of tools, safety equipment and make sure to clean the Studio before they can leave. The program is centered around three core design elements: wood, paint and fiber arts. Participants will build a variety of projects during their sessions (tier). While your student is waiting for glue and paint to dry – we explore other subjects related to their projects – including: art, chemistry and painting. We also show them how to protect their final projects with the use of finishes and composites such as resin and fiberglass (the same materials they use with many boat kits). At no time - is your student required to make a project on their own. If they would rather help other students as a team - they are more than welcome to do that. This excludes BSA requirements where applicable. Boy Scouts - we cannot guarantee you complete any of the merit badges listed in this program. However, if you truly want to put in the effort - we will help you successfully complete the merit badge. This activity is designed for Scouts and non-Scouts, boys, girls ages 12 -18*. Bring your friends and family. Each participant is required to pay the class fee(s) and actively participate in the class. This series of classes is intended for students who enjoy working with their hands, hearts and minds. Each participant must be able to work with hand tools (or have a parent/guardian who can work with hand tools) and be able to follow directions. Not a Scout? No problem. Can my student bring a friend for one day? What if my Scout already has some of the merit badges listed? We are open to Scouts and non-Scouts, boys, girls ages 12 -18*. The program goes from beginning to end and is structured to cover the merit badges listed. At this time - we cannot ‘ala cart’ activities specific to each Scout. Even if your Scout has earned a merit badge or two – I guarantee that we are going to cover the subject(s) from a different angle and that the entire group will benefit from your Scout’s experiences. * If your child is age 11 and would like to attend - please contact John Hodnefield - maker@boardwalkdiy.us. Fees include building space, materials, tools and storage. This covers all materials and project fees. There are no discounts at this time. Groupon codes do not apply to this program. 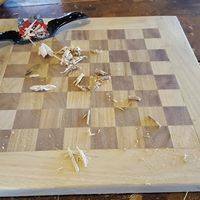 If you/your student chooses to not complete a certain project (for example: they don't want to build the chess board) - there is no discount applied. Tiers are repeatable if your student wants to help build another project - or need/want to complete another merit badge. 2 hr classes (pick a day and a 2 hr block that works best). We may open more days/times if needed. Note: Tiers are NOT based on skills learned from other Tiers. Tiers are used to simply separate the different offerings. They can be taken in any order. There are 3 Tiers (or sessions) that your student can participate in. Each session has a few differences that make them unique. Works through course material from beginning to end. This includes general subject matter, tooling techniques and overall flow of the program. Each Tier is intended to be as unique as possible - so your student could potentially participate in more than one Tier. Each Tier has their own unique set of skills based projects, assignments and service hours in order to keep the material fresh and interesting. Students who have completed one or more Tiers have the opportunity to become an assistant (Woodwright Apprentice) - giving them an expanded set of options for merit badges and/or other topics. Tier 1 sessions begin the week of October 15th. Tier 2 sessions begin the week of January 7th. Tier 3 sessions begin the week of March 25th. Our sessions and activities follow the Anoka Hennepin Public School calendar. This also included school closings for weather and/or other emergencies. Boardwalk DIY Studio has no plans on changing the schedule for any session. However, if a change becomes necessary – we will work with all affected participants to find a solution. Basic Safety Gear is provided. We will also have required safety gear that you can either purchase from us or from other vendors. We do strive to supply all safety gear - however, some gear is more ‘personal’ than others. * Feel free to donate your used respirator after the finish of the program. All filters will be used and not returned. Over Ear Hearing Protection (ear muffs) [AMZN] - only if ear plugs may not be enough. Must bring a current merit badge book and workbook for each merit badge they wish to earn. most of these will be completed during the sessions. Scouts must complete these requirements outside of class sessions. If any of these merit badges take longer than the 6 weeks we have as a group - I will be more than happy to meet with Scouts during open sessions to finish the badge. #4. Scouts will have a chance to render a project in paint (acrylic/water base) and pencil. They need to complete 2 more projects. #6. With your parent's permission and your counselor's approval, visit a museum, art exhibit, art gallery, artists' co-op, or artist's workshop. Find out about the art displayed or created there. Discuss what you learn with your counselor. #2. We cannot guarantee a field trip to a financial institution. If anyone can help with that - that would be great. #3. Tier 1, will not complete the stock investment exercise, however Tier 2 and Tier 3 will compete in the ‘Stock Market Game’, sponsored by Best Prep, Allianz Life Insurance Company of North America, RBC Wealth Management and Wells Fargo Foundation Minnesota. #3. Scouts must build the Cartesian diver on their own and bring to class during the week. #4. They must also complete Requirement #4 off-site. #4b. This will be homework. #5. This is quite a bit of work for each Scout to take on. Scouts are more than welcome to complete this requirement during the session (including homework). If they really want to experience this piece - we suggest completing the Minnesota Business Venture program - during the summer - offered by BestPrep. #6 and #7. This is the Scout, developing and presenting their invention. While the end result varies widely - the Scout should finish each requirement carefully and completely. We will have time to work on some of these requirements during the sessions. It is recommended that Scouts be 1st Class and have earned First Aid and have their Totin’ Chip. This list may be modified at anytime. No use of electronics without permission by instructor(s). Students will be expected to work as a team AND to the best of their ability. They will NOT be allowed to disrupt others. John Hodnefield has been with BSA for over 10 years and is an Eagle Scout (1991), Wood Badge trained and member of the OA. John is also current with BSA Youth Protection. Boardwalk DIY Studio volunteers are not licensed teachers, daycare providers or babysitters (for lack of a better term). We do have over 11 years of mentoring and teaching students ages 7 – 17 and over 20 years in wood working, crafts, business and entrepreneurship. All of the student apprentices and adults helping in these events are volunteers. Please treat them with respect and learn from their experience. Students will be permitted to leave the facility – only at the approved end times for each day – OR when a parent/guardian makes arrangements to pick them up outside of the daily schedule. If parent(s) must be called to pick up their child because of their child’s inability to follow rules and expectations at an activity – there will be no refunds, no re-admittance for the rest of the week and an approved parent/guardian must pick them up from the session. We cannot let the child leave and walk/bike home on their own. Please don’t attend if you think this is an easy way to earn a few merit badges. Your attitude and drive will either help you – or allow you to fail. We are here to help those who want to succeed. If you/your student continually interferes with the class – we will be forced to dismiss them from the class. If you think your student may have issues – please be respectful and remain in the parking lot. Remember, no refunds.